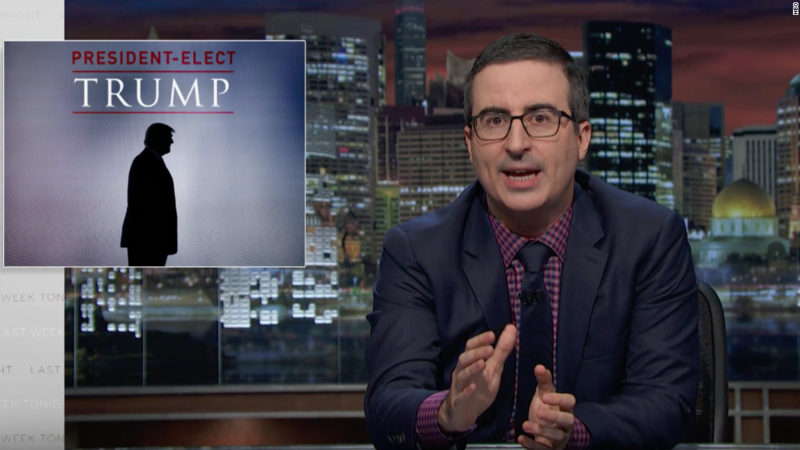 In his first episode following the election, John Oliver only had one thing to talk about: President-elect Donald Trump. The HBO talk show host, who has been a major critic of Trump, devoted the entirety of Sunday's season finale of "Last Week Tonight" to figuring out how Trump won and where the country goes from here. A task that did not come easy to Oliver. "It's important to remember many people are happy to see him in office," Oliver said. "But for the rest of us, we are faced with the same questions as a guy that woke up the day after a Vegas bachelor party, deep in the desert, naked, tied to a cactus and a dead clown. Namely, how the [expletive] did we get here? And what the [expletive] do we do now?" Oliver spent the whole broadcast on wide-ranging Trump topics that included everything from the promises Trump made on the campaign trail, which Oliver said sounded like the "to-do list on Satan's refrigerator, which of course Satan no longer needs because Hell has frozen over," to Trump randomly changing his mind on issues. "Trump is like a Magic 8-Ball, every time you shake him he gives you a different answer," Oliver said. The British comedian also took on the media's role in the election and the impact of fake news on social media. "[Trump] came along and told millions of people every crazy email you've ever forwarded was true," Oliver said. "And that, at least in part, is why he will be our next president." Oliver finished the episode by telling his audience to not move to Canada but rather "stay here and fight" by donating to organizations like Planned Parenthood, news outlets and "actively standing up for one another." "It is going to be too easy for things to start feeling normal, especially if you are someone who is not directly impacted by his actions," Oliver added. "So keep reminding yourself. This is not normal." HBO, like CNN, is owned by Time Warner.